RICHMOND – It took more than an hour, but more than two dozen men appeared in U.S. District Federal Court in Richmond yesterday to be arraigned on a variety of charges related to outlaw motorcycle gxxx activity in the region. The men – standing before the judge one at a time, and being led into the courtroom in small groups – included Jack “Milwaukee Jack” Rosga – whom federal officials in indictments described as the group’s national president and two local men Charles “Chuck” Barlow, 43, and Dennis “Chew Chew” Haldermann, 45 both from Chesterfield. 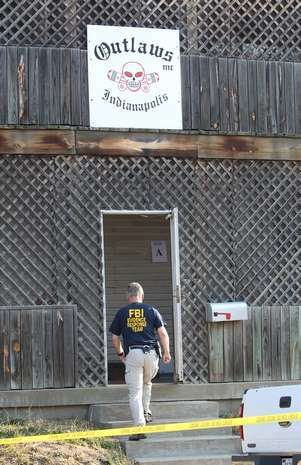 Barlow and Haldermann were listed in the indictments as alleged members of the allied Pagans Motorcycle Club. According to a federal indictment, the biker gxxx operated in Petersburg. Halderman n was charged in count three of the indictment – violent crimes in aid of racketeering activity. The indictment charges nine others with this offense, which involves an alleged assault against the Desparados Motorcycle Gxxx on or about March 14, 2009. The maximum penalty is 20 years in prison. According to the indictments, Outlaws and Pagans members set a trap and assaulted rival Hell’s Angels and Desperados Motorcycle Club members at “Cockade Bar” – later confirmed by the U.S. Attorney’s Office for the Eastern District of Virginia to be Cockade City Grill. On March 14, 2009, three members went into the bar in “colors” – a vest signifying membership in the club. One man stood outside the bar in colors as a lure, while three other Outlaws members were waiting inside without the vests. 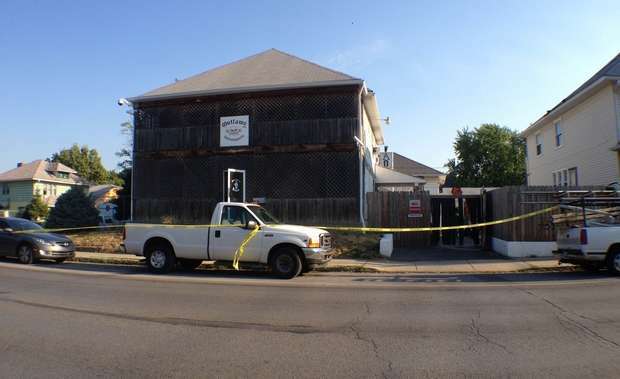 Several others waited outside to trap rival bikers inside the bar, where they were assaulted. Barlow was also one of the 10 charged with violent crimes in aid of racketeering activity for his alleged role in the assault against the Desperados Motorcycle Gxxx in March 2009. The indictment says that in July of last year, Rosga ordered a crowd of Outlaws at the Petersburg Clubhouse to shoot Hell’s Angels and other rivals. In October, members meeting at the Petersburg Clubhouse discussed assaulting Hell’s Angels over a recent attack in Florida that sent two Outlaws to the hospital. Following a shooting attack of a Hell’s Angel in Maine, a member asked about staying at the Petersburg Clubhouse to avoid attention up north. As recently as February of this year, the Petersburg Clubhouse – the location of which was not revealed in court documents – allegedly took delivery of illegal gambling machines from North Carolina. In March, 0 of gambling proceeds were transported from Petersburg. The indictment also says drugs flowed through the Petersburg Clubhouse. A member allegedly sold 66 Oxycodone pills and six muscle relaxers in October 2009. On the same day, an undercover agent purchased 3.5 grams of cocaine, which was then taken by Outlaws. In March 2010, an undercover agent purchased 2.85 pounds of marijuana at the cost of ,680 from a fellow Outlaw. That Outlaw was later stopped attempting to transport another five pounds of marijuana from Montana to Virginia. The Outlaws moved into Virginia in 2006 after coming to an accord with the Pagans Motorcycle Club. Members must be men over age 21 who own a domestic motorcycle. They attempted to expand their profile with a “show of force” of national members, along with Pagans, at a Cycle Expo in Richmond. However, law enforcement refused entry to many Outlaws and diffused the threat. In 2007 and 2008, Outlaws threatened members of the Virginia Raiders, Black Pistons and Merciless Souls Motorcycle Club, affiliates of the Hell’s Angels. The Outlaws, formed in Chicago in the 1930s, are longtime rivals of the Hell’s Angels, adopting the slogan “Angels Die in Outlaw States – Adios.” The Hell’s Angels, Pagans, Outlaws, and Bandidos are considered the biggest motorcycle gxxxs by the FBI. The 12-count indictment – which was returned on June 10 – charges that the men participated in a criminal enterprise that engaged in a wide range of crimes, including attempted murder, kidnapping, assault, robbery, extortion, witness intimidation, narcotics distribution, illegal gambling and weapons violations. Movie Monday: the best in indy chopper flicks! Biker TV, Book Reviews and Author News, Motorcycle Club, Product Reviews Comments Off on Movie Monday: the best in indy chopper flicks! Scott Di Lalla and Zack Coffman of One World Studios bring us what is perhaps the best of the best in home grown biker documentaries. 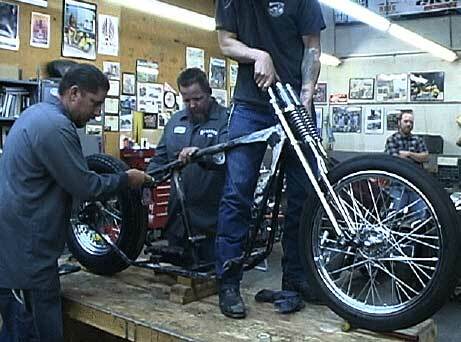 Choppertown, The Sinners was produced in 2005 and focuses on the build of Kutty Noteboom’s Evo, the Sinners’ Special. 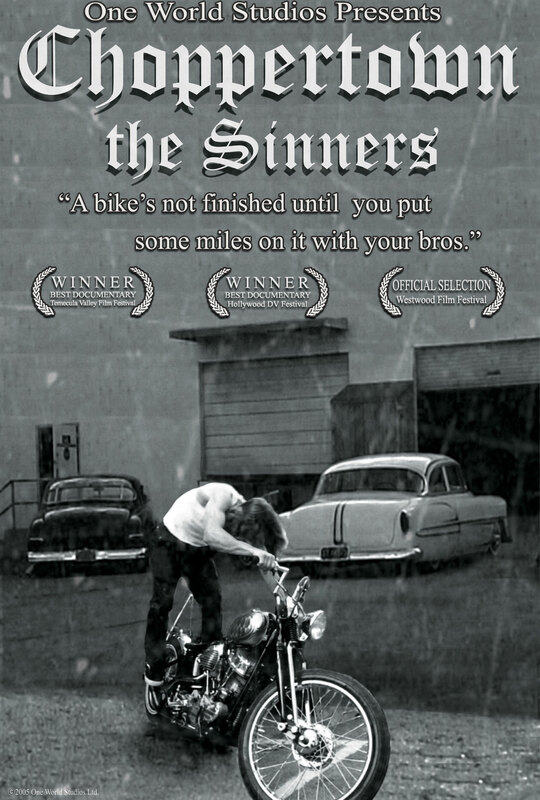 Along the way, we are introduced to the men that make up the elite group of bikers who are bestowed the privilege of wearing the Sinners patch on their backs. And we, as a tremendous pool of citizens, get to wish and dream that we could someday be accepted into the fold. Viewers are immediately pulled into the timeless look of the video. American Cars and bikes from the 40’s and 50’s are met with British imports from the 60’s and 70’s in a mishmash of color, black and white, and low contrast sepia toned footage. Camera angle and points of view through car windows, at ground level, and from unexpected perspectives keep the scenes flowing along and keep the viewer interested in the camera work as well as the action being captured. Interviews are engaging and allow us a little insight into this group of young men who have come together in such a way as to rival any family or brotherhood. Wives and girlfriends may or may not understand entirely the love these guys feel for one another, but they sure do throw their support into the ring… as if they really had much choice in the matter. Members of the club come from all walks of life and are bonded by a love of bikes, cars, and music. Many of the members are musicians and their flavor of punk rock and rockabilly can be heard throughout the film. We even have the opportunity to see some of them perform as the group gets together to see a brother play in a show, or the band sets up at the garage for a get together. And the garage is where it’s at. The theme of the film is the build of Noteboom’s bike and we get to hear a bit of the life and love philosophy of some of the members as they explore the build of a timeless machine that is infused with the soul of parts older than the man who will ride it. Oh, and there is beer… a bit of beer… lots of beer… you can’t build a bike without it. Choppertown is a film I have lived with for a while and it still excites me as much as the first time I watched. I bought my first copy in 2005 after it was released. 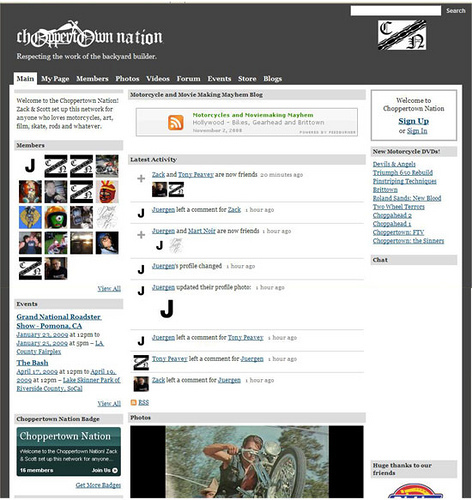 There was a lot of buzz on the message boards like the Jockey Journal about the debut, and then all you saw for months were posts from people around the country and world who desperately wanted to join up and be included… of course, that’s not the way it works, but I think that the documentary was a tremendous success simply based on this reaction. About six months ago, I was sent a second copy of the film (I had since lent my original to a brother who lent it to a brother who… you get the idea). I popped it in and was just as entranced as the first time I saw it. I again wanted to get to know everyone on a personal level. Luckily for me, this time around I was able to throw in the companion disk, Choppertown From The Vault. This DVD goes right along with the first film and lets us see a little more. Shot at the same time, the second film does not feel like sloppy seconds. In fact, it does a nice job of letting us see more of what goes on in the garage, hear more of the music the members are responsible for, and lets us into their lives for a couple more hours. So, what to do?? Order yourself both of these DVDs and get some of the boys over to watch with you… just be sure that you leave some time to get out into the garage or hop on the bikes and blow around town together. You will be inspired. — Be sure to check out the social networking site, www.ChoppertownNation.com. Here you will be able to connect with like-minded individuals and shop for the very best in chopper, biker, and kustom kulture flicks… the store here rocks! After doing a little shopping, look me up and send me a friend request! See you on the board.